France is opposite Greece and Italy a relatively young wine country. The first vines brought in the 6th century BC. BC, the Greeks, the Massalia (Latin Massillia = Marseille) founded in the southwest on the Mediterranean coast. At that time, the country, later designated by the Romans as Gaul, was replaced by the Celts inhabited. It developed a busy trade and the Greeks covered the need. When they immigrated to the Po Valley in the 5th century, they became acquainted with Italian wine and began to import it. So the later French had been consuming wine for a long time before they began to grow one on a larger scale. The conquest of Gaul by Julius Caesar (100-44 BC), there was a systematic dissemination. This took place in the 1st century in the Rhône valley, in the 2nd century in Burgundy and Bordeaux and in the 3rd century on the Loire. The Roman Emperor Marcus Aurelius Probus (232-282) lifted the ban on Emperor Domitian (51-96) and ordered the planting of vines throughout Gaul in the middle of the 3rd century. 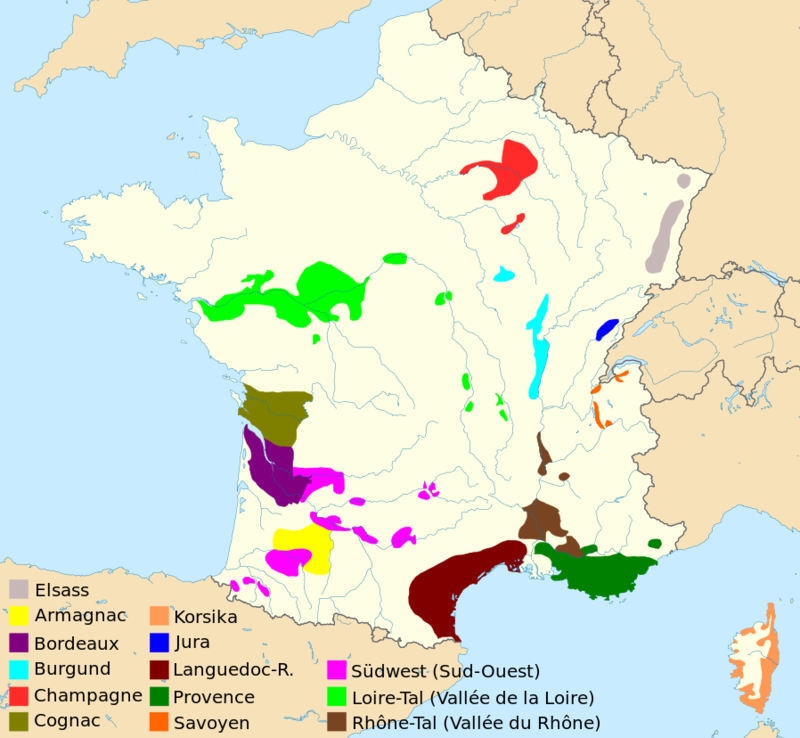 The king of the Franks and later emperors Charlemagne (742-814) gave decisive impulses for the viticulture in today's France by its regulations. In the monastery Cîteaux in Burgundy, in 1098, the Catholic Order of the Cistercian founded, which spread rapidly across Europe. The monks perfected viticulture in terms of soil type selection, grape selection and wine production, which had an impact throughout Europe. But equally important for viticulture was the Order of the Benedictine whose most famous member is probably Dom Pierre Pérignon (1638-1715) was the "inventor" of the assemblage, the artful intersection of wines. It is also worth noting that the wine was included in the French Revolution calendar, the September was named Vendémiaire (Wine month). In 1855 found the famous Bordeaux Classification which had a major impact on the quality-class systems that subsequently developed, but which are very different in the individual regions (see below) Grand Cru ). Shortly thereafter, the country was the starting point of the largest and most extensive disaster in the history of viticulture, as from the 1860s, the phylloxera as well as true and false mildew started their extermination campaign all over Europe. Especially France was severely affected, over three-fifths (700,000 ha) of vineyards were destroyed. At the same time, however, the "Golden Years of Bordeaux" signaled a new beginning, when vineyards were planted on a grand scale in the Médoc. In France it was recognized early on that on a certain soil type, under the influence of the local climate (Microclimate), certain grape varieties as well as the art of the winegrower a wine with unmistakable characteristics arises. The beginnings already made the Cistercian, In the first third of the 20th century, the term was used terroir embossed. The owner of the estate Pierre Le Roy de Boiseaumarié (1890-1967) described in the 1920s, the ideal grape varieties for the Châteauneuf-du-Pape due to the typical soil and climate in an area defined by him. Further impetus was given by agricultural professor Joseph Capus (1868-1947), who together with Boiseaumarié as initiator of the appellation system applies. Today, French wine is regarded worldwide as something out of the ordinary and as an expression of cultural perfection. The well-known English wine author Hugh Johnson He has aptly described this in his book "Atlas of French Wines": "Throughout history, a form of cultural perfection has developed in various parts of the earth that eludes any logical explanation. If one thinks of the Middle East, this is the religious fertility, the name Germany combines with music, the name Italy with architecture. But those who speak of France think involuntarily of table pleasures. The French choose and prepare their food with as much zeal and care as no one else in the world. Surely this ingenious talent to enjoy has helped the French become the creators of the finest wines. " Regarding the grape varieties prevail different philosophies or styles. In the south and southwest, especially in Bordeaux, especially the red wines are mixed from several varieties, these are the classic cuvées for which there is the term Bordeaux blend gives. In the northern areas, however, such as Chablis, Alsace, Loire, Savoy and especially in Burgundy, the wines are mostly unmixed pressed from a grape variety. Especially in Burgundy, the layering and the associated classification system are particularly pronounced. In the context of clearing programs The EU was cleared in the period 1988 to 2010 about 180,000 hectares of vineyards. This affected especially Languedoc-Roussillon. VDQS (Vin Délimité de Qualité Supérieure): The stage was created in 1949 as a preliminary stage for the AOC rank. The production guidelines must now be prepared according to AOP standards and proof of the relation to the terroir. These wines are thus highly classified to AOP. Influential French wine writers or wine critic are or were Michel Bettane, Guy Bonnefoit, Pierre Brejoux Thierry Desseauve, Patrick Dussert Gerber Odette boat, Alexis Lichine, Émile Peynaud, Olivier Poussier, André Simon and Christian Vanneque, To the most important wine magazines or wine guides count the four works Guide des Vins, Hachette, Le Guide des Meilleurs Vins de France and Le Grand Guide des Vins. Besides national there are also some important international ones Wine-producing institutions headquartered in France for research and development, standards and standards as well as professional representation. These are CPVO (Community Plant Variety Office), FIJEV (Federation Internationale des Journalistes et Ecrivains des Vins et Spiritueux), IFV (Institut Français de Vigne et du Vin), INAO (National Institute of Appellations d'Origine), INRA (Institut National de la Recherche Agronomique), ISVV (Institute of Sciences of the Vigne et du Vin), OIV (Organization Internationale de la Vigne et du Vin) and UPOV (Union Internationale pour la Protection des Obtentions Végétales). This page was last modified at 20 February 2019 at 08:32.